Diabetic Foot Ulcers: Causes and Treatment. Approximately 13% of individuals living with diabetes develop diabetic foot ulcers due to poor circulation. Insufficient arterial inflow to the lower extremities leads to foot ulcers and is the key factor in delayed healing. The VeinOPlus Vascular device improves arterial inflow 5 times to the lower extremities. After one-hour of VeinOPlus therapy, perfusion is improved approximately 20% and healing is accelerated. VasoCARE recommends four, one-hour therapy sessions per day in treating an active ulcer. Once healed, the recommended maintenance protocol is two, one-hour VeinOPlus therapy sessions daily to prevent recurrence. Four, one-hour therapy sessions per day. Once healed, recommended maintenance protocol is two, one-hour daily sessions to prevent recurrence. 20 minutes later, TcPO₂ level were taken to measure residual index readings. 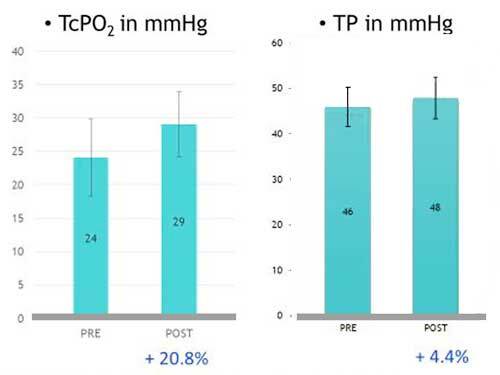 Rapid venous emptying by the VeinOPlus increases arterio-venous gradient pressures, increases TcPO₂ and Toe Pressure levels, and accelerates healing.